From Little Norway Park which was first established in 1986 along the waterfront of Lake Ontario, the scenery of the Toronto city skyline is beautiful at dusk. The calmness of Lake Ontario allows the reflections of the buildings, the main one being the CN Tower, to shimmer across its surface. Luxury boats dock along the waterfront in the downtown core of the city as the deep blue hue of the sky fades as dusk takes over and the clouds move in. The fast pace of the city life begins to slow a little as many of the office buildings are emptied around dusk and people head home, but the city is never totally quiet as the nightlife just begins. Picture of the scenery of the skyline of the City of Toronto, Ontario from across Lake Ontario in Little Norway Park. 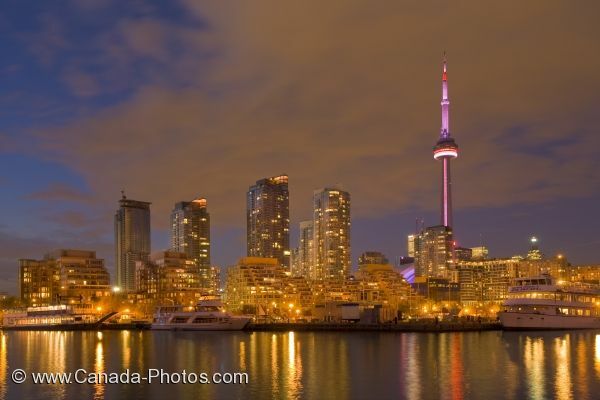 ... From Little Norway Park, one gets the full effect of the illumination and the beauty of the Toronto City skyline.